Probably the best known of Kirk’s hybrids, and for good reason. ‘Joey Tomocik’ is without doubt the most vivid yellow hardy water lily I know. Even young plants show a remarkable depth of colour. These young flowers are often somewhat cup shaped, but as plants mature subsequent blooms are more stellate. 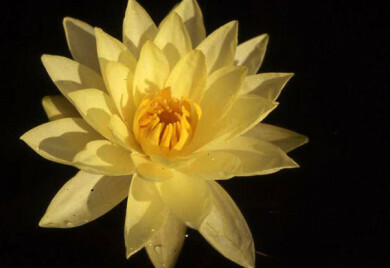 A very dependable, tough and free flowering waterlily that spreads 3 to 4 feet and produces bright yellow, stellate shaped flowers. The 4 to 5 inch flowers rise 3 to 4 inches above the water surface and the leaves are faintly mottled with maroon blotches. Place in full sun and fertilize throughout the warm months. Cold hardy to 15 degrees F. Hybridized in 1993 and dedicated to Mr. Joe Tomocik, curator of the Denver Botanical Garden, and named after his daughter Joey.. When viewed from a distance the flowers literally stand out from the crowd. The way this variety holds its flowers high above the foliage greatly accentuates this. This is an extremely adaptable plant which is equally at home in a tub or a large pond. Given enough space this is quite a large vigorous plant. Call Sunland Water Gardens (Click to Call) (818) 353-5131 for availability! 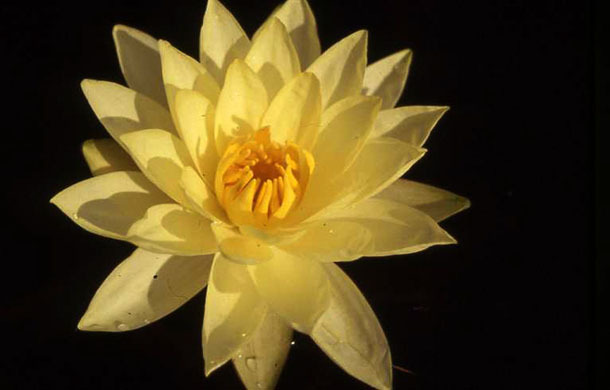 A leader in Aquatic Plants – A Grower of Water Lilies for Ponds! Contact the pond experts today at 818-353-5131.